Britain's Beer Alliance, the umbrella body representing the beer industry, has launched a new series of digital outdoor ads as part of its £10 million 'there's a beer for that' campaign. 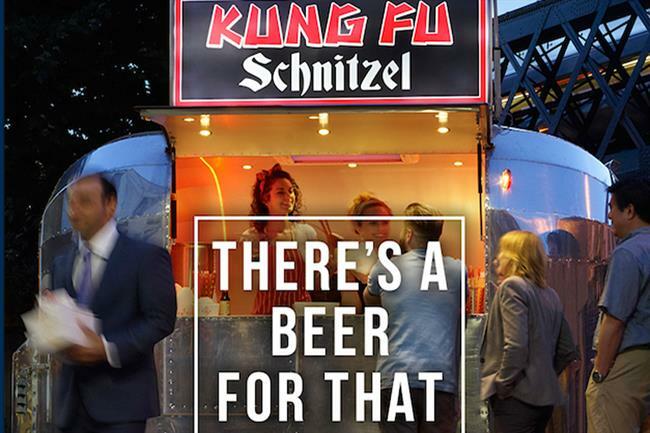 Devised by creative agency SapientNitro, the ads are aimed at reigniting Britain’s love for beer and highlighting the drink's versatility with various foods, even with those as leftfield as 'Kung Fu Schnitzel' (a fictional food brand to illustrate the modern popularity of fusion street food). The campaign launched yesterday (24 August) and for the next five weeks ads will appear on digital billboards across London, Birmingham and Manchester. The ads will appear in the late afternoon and early evening in train stations, high streets and roadsides to coincide with passersby deciding what and where to eat. Mark Hunter, SapientNitro's executive creative director worked alongside creative team Edward Copeland and Lee Williams. Dan Burn Forti was the photographer and Mindshare handled the media. Hunter said: "Food and drink are such a huge part of British culture, so with the British Beer Alliance we looked to create an integrated story across media channels and digital to show how beer in all of its flavours and styles can really add to the enjoyment of a meal out or at home."